Talk about letting time get away from me! I have lots to catch up on from these past few months! First off, let me just say to all of you out there who have been reading the Hulk issues and cared enough about what I thought about the issues to email me – thanks! I know I have been slacking lately with keeping this blog up to date but also I am very thankful that this blog has enough dedicated fans to not desert it all together! That being said, let’s just dive right into what Mr. Duggan has been serving us with. In 2008, we in the Hulk community we introduced to a new Hulk villain, one that rivaled even the his toughest foe, The Abomination! This new addition to the rouges gallery is the Hulk’s worst nightmare… another, more powerful Hulk! A mysterious figure whose first act was killing off the Abomination himself! This new series worked like gangbusters as copies flew out of the stores and catapulted the Hulk to the top of the sales charts! This was all good news – but, come to find out, short lived. The series itself was not well thought out and the character, whose personality and powers were so undefined, didn’t even have his own name. The Red Hulk’s origin, slated for a mere 6 issues, could have been epic – but money spoke louder than well intended story arcs and, with sales at an all time high, they told Loeb to keep on writing without giving the readers what they strived for and were promised the most: the identity of the Red Hulk. There is something to be said for patience… something about good things coming to those who wait… but this isn’t true for all things and that series was proof of that. Sure enough, no one cared when the Red Hulk was finally “unmasked” as Thunderbolt Ross – with his daughter being dragged into this ruby mess along the way. Soon, the Red Hulk series went to the wayside – but not before he had joined the Avengers in an ill fated attempt to keep people interested. Without anyone left to care about him and Marvel scratching their heads about what happened to their brilliant plan to cash in on a seemingly new character they gave the Red Hulk a new title. The Thunderbolts was born straight from the pages of the Red Hulk series at a time when the Hulk still sold like gangbusters! Of course, this too didn’t last as the Red Hulk was truly revealed to be what he always was… a flash in the pan. He continued to stick around the MU though – like a piece of corn stuck in your teeth that you just can’t seem to release – the Red Hulk continued to be a presence that would stick out like the impostor he was. Until Duggan came along, that is. Did Marvel realize their folly and ask Duggan to come aboard to dispatch of the crimson mistake – or was this all his idea? I don’t know for sure but I can tell you that, what ever the reason, Duggan came along at the right time to clean up the whole Hulk corner of the Marvel world. Get rid of the wanna be’s and return the classics to their former glory. 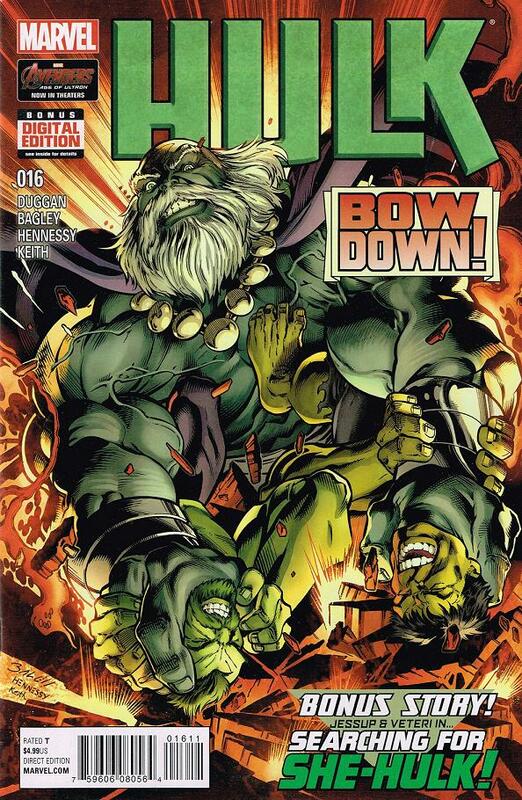 Every issue presented to us was a welcoming relief that every Hulk fan has been asking for! No more A-Bomb, instead we have classic Rick Jones back! Red Leader – no thank you – Classic Leader? I actually stood up and cheered! Red She Hulk – GONE! Skaar? Out of business! It was like a knock out punch with every issue. It was glorious. 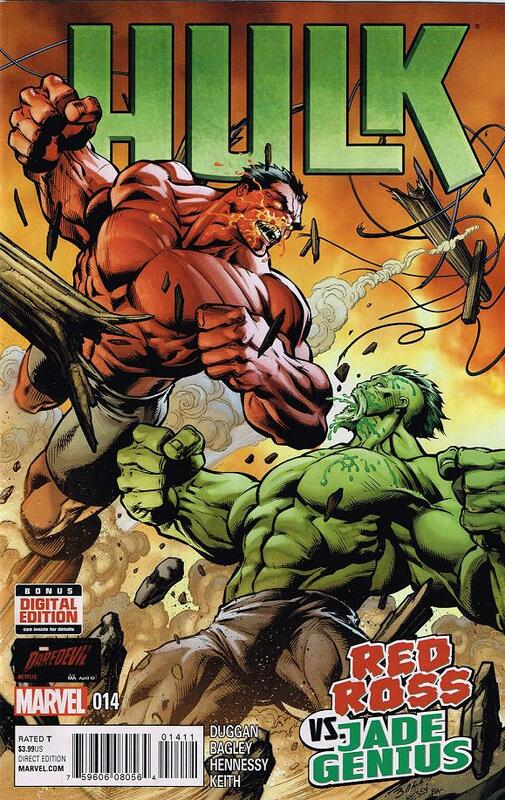 We all knew what was coming next… the Red Hulk. Everything was leading up to a showdown where the Hulk (the good doctor) was either going to “cure” Ross or go down trying. I won’t go into gruesome details – but the battle was bloody, brutal and ended with Ross (the CURED Ross) being taken away to answer for his crimes. 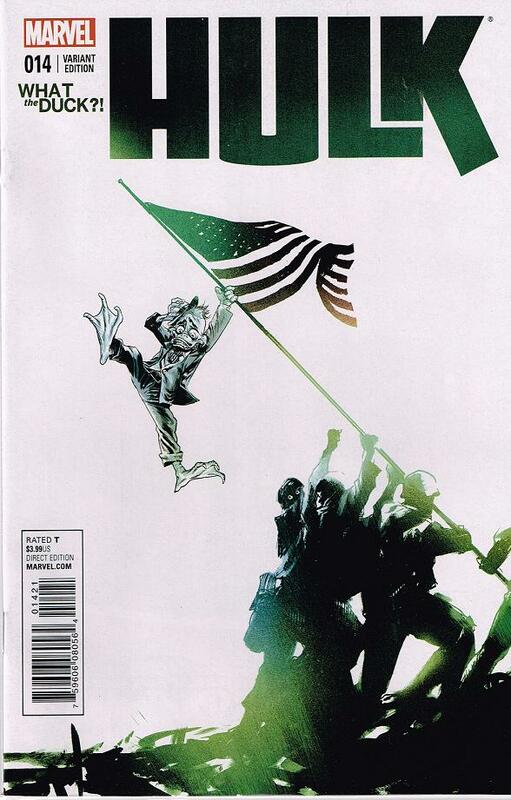 Everything about this issue was great – including the masterful way Ron Garney has handled the art in this book. It harkens back to the days of McGuiness’ skilled pencils and his uncanny way of making battling monsters look like a true art form. I have always stated that if the Red Hulk was handled with a more serious tone – in a way that was not laughable and inconsistent – we could have had an epic new era of Hulk stories. 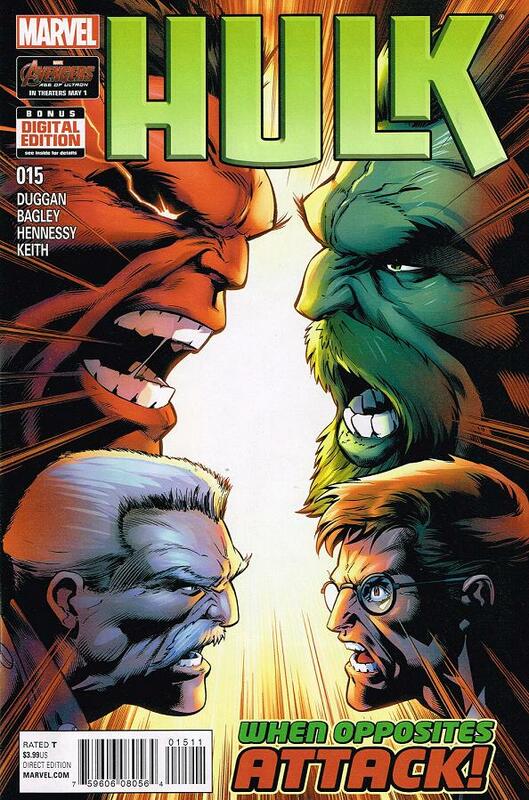 Loeb ruined what could have been a new turning point for the Hulk after the masterful Planet Hulk and the underwhelming but still entertaining WWH. But he mishandled the plots, the mystery and ruined his own reputation with the silly drivel he handed us. Thank you to Duggan for making the series exciting again! This comes years after other writers have tried their hands at making the Hulk a readable character. 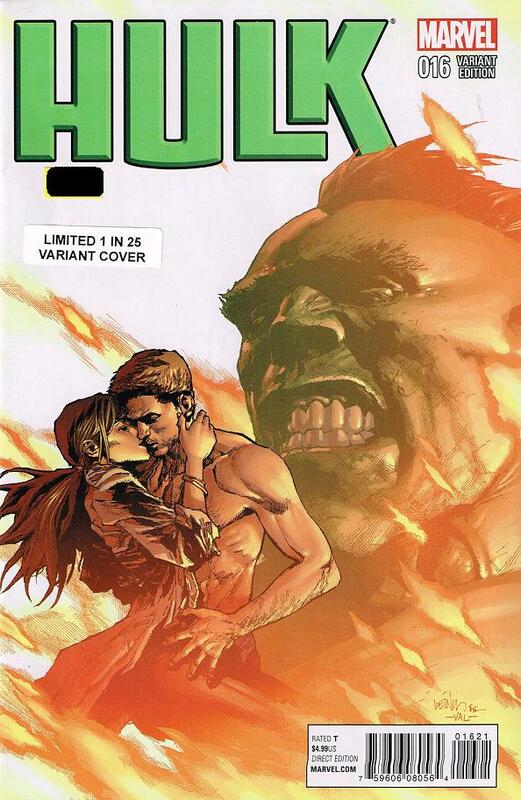 Aaron’s disaster of a series gave us nothing of value, Waid’s take on the Hulk was a misunderstood love letter to the character. Of course, the fan reaction didn’t help. I even heard that Waid had admitted to writing things into the Hulk just to piss off the “super fans”. But it took Duggan to bring back the real fun to reading the Hulk – it took Duggan to undo the disastrous Hulk Family to really make me enjoy these monthly issues once again.